[Optional] ABC is considering a reboot of Designing Women! Would you watch? Actress Cybill Shepherd starred in both Moonlighting (where she played a detective) and Cybill (a sitcom about a divorced mother). Various sources are now reporting that Les Moonves made a move on her… and then ruined her career when she did not capitulate! Actress Cybill Shepherd, who once starred in the CBS sitcom “Cybill” alleged in a recent interview that former CBS CEO Leslie Moonves propositioned her while they were dining at a restaurant. Moonves was ousted from CBS in September in the wake of allegations from women claiming he subjected them to unwanted sexual harassment, and would treat those who resisted him punitively. Moonves has denied engaging in any non-consensual behavior. His departure has resulted in the installation of a new board at CBS Corp. and plenty of speculation over whether Moonves will get any part of $120 million being held as a potential severance payment. Actress Cybill Shepherd claims that her 1995-1998 show “Cybill” was canceled abruptly after she refused an advance from now-disgraced former CBS boss Les Moonves. Shepherd appeared on SiriusXM’s “The Michelle Collins Show” where she discussed her previously popular series and boiled down its abrupt cancellation to one dinner she had with Moonves. She claims that “quite shortly afterward” her show began getting marred by notes from Moonves about what she could and couldn’t do on it. When asked what she thinks would have happened if she hadn’t refused Moonves’ alleged sexual advance, Shepherd answered in no uncertain terms. It is reasonable to assume that Shepherd had multiple interactions with Moonves over the years and that she simply chose one particular story for the radio show. Shepherd would have been approximately 40 when Moonlighting was cancelled and approximately 48 when Cybill was suddenly cancelled. Both Shepherd and Bloodworth-Thomason worked closely with Hillary Clinton on Clinton’s Presidential campaign. Congratulations to Ireadtoomuch for being first with the correct response! I have wondered if the actress was Cybill Shepherd coming off of “Moonlighting”. It was not a CBS show, but they don’t “say” it was a CBS show, just that she was “Coming off the cancellation of her iconic detective show”. Could also be Angie Dickinson. I think it’s Cybil Shephard. I would 100% watch. I’ve seen reruns of several 90’s shows, and have wondered why we don’t see those shows anymore. It sickens me that one person can damage another person’s career due to sexism or racism. And it makes me side-eye Julie Chen for staying with this monster. Don’t know the crying actress, but PLEASE! No more reboots!!! IMO, it ruins the integrity of the original. ITA about it ruining the integrity of the original. I have yet to watch any of the reboots and mostly just give them the side eye until i stop hearing about them. No idea who the actress is either. I wasn’t a big fan of Designing Women but I did watch quite a few episodes. I would so love to see Evening Shade come back. I was heart broken when it went off the air. Cybill Shepherd, she’s Still georgeous. Wow. He’s a real piece of work. Then again, it seems to be the norm in Hollywood. 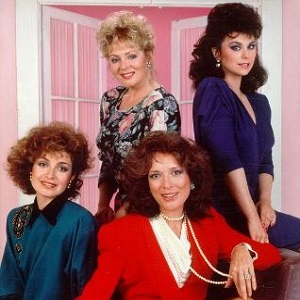 I loved Designing Women. I might watch a reboot. Behaving like that to Angela Lansbury is punished with execution in the United Kingdom. Sharon Gless from Cagney & Lacey? I’m not a big fan of reboots, but I really liked Designing Women, so sure! Guessing one of the Charlie’s Angels cast … Kate Jackson? I doubt it; Charlie’s Angels was on long before Designing Women, which was LBT’s heyday. Crying actress: Angela Lansbury of Murder She Wrote. I enjoyed the original Designing Women alongside The Golden Girls. Leave them both alone – we already have too many reboots, failed or no. I’m not even venturing to guess. I have always loved her style and am glad to see her name again. He’s a pig. Good riddance. He didn’t do that to Angela Lansbury, did he? Oh yes! I had forgotten about how thick Linda and her husband were with the Clintons! Also, whenever Dixie Carter had a script calling for her to go against her political beliefs she made them let her have a singing part on different episodes. Linda and her husband had a bad reputation for their writings on DW and their bullying ways. But I loved the show and would check out a reboot. I would watch it IF it wasn’t filled with left wing politics, which it probably would be. Hollywood needs to get the message that we are OVER their hypocritically-pious messages. And Les Moonves is a total creep! Sharon Gless From Cagney & Lacey. As absurd as that might sound, I’ve read that she was harassed (and worse) while in Hollywood. I hope what I’ve read isn’t true and that this guess is silly. But at this point, nothing in Hollywood surprises me anymore. It just makes me angry. Linda is yet another talented woman who got stepped on because she refused to be bullied and harassed by a cretin. This is so disgusting. That he would stick his tongue down Cybill Shepherd’s throat in a public place says everything you need to know. I’m sure it was witnessed by many yet I’m assuming that anyone even bothered reporting it. The CBS board needs to be investigated top to bottom for allowing this garbage because I’m sure it reached them over the decades. Sue them all. Iconic detective female, too old? Either Angela Landsberg, Angie Dickinson, perhaps Stefanie Powers? [Optional] ABC is considering a reboot of Designing Women! Would you watch? Absolutely. I always thought that Linda Bloodworth Thomason had EP rights. Dear Linda, I am so sorry to be reading this. Designing women was always my favorite tv show. I was so sad to see it go. The question I have in all of this??? Why the frack, how the hell could these women stay married too and be PROUD to carry their names? Julie Moonves, your career is dead. You are on the same level of pond scum as Harvey and les. May you finally get what you’ve got coming to you. Angela Lansbury, from Murder, She Wrote…though I don’t see her crying. I would love a Designing Women reboot, if it’s cast appropriately. Actual smart, diverse cast of strong, well-spoken actors. Love her. Terrific article, funny and sharp as hell, as always. I’m guessing the actress was the ever classy Angela Lansbury. We can only hope Les Moonves develops a permanent urinary tract infection. I know I’m praying for it. I will now! Of all the #metoo stories, this one made me the angriest at the sheer waste of talent and lives because of pigs like Moonves. 1) Yeah, I figured Gless as well. 2) Can Thomason sue Moonves at all over trashing her career? It’s enraging as hell powerful men can still waste talent and wreck lives doing this crap. YET SHE LICKED, KISSED, AND STRAWED THE * OF BILL AND HILL. THE WAY HE LOOKED AT ARIANNA WHOUD MAKE A CANNIBAL AT A MISSIONARY CONVENTION BLUSH. I TRULY IT WAS BILL’S WAYS THAT DROVE DELTA OVER THE EDGE. LINDA IS AS BIG A HIPPOCRIT AS MERYL STREEP. Curses on Lee Moonves for treating her this way. No the first one was classic. The iconic detective show that keeps popping into my mind is ‘Cagney and Lacey’. If that’s the show to which the author is referring, then the crying actress would be Sharon Gless or Tyne Daly. I would lean more toward Sharon Gless. It could be ‘Charlie’s Angela’s, as that was definitely iconic! So Jaclyn Smith, Farrah Fawcett and Kate Jackson are contenders for crying actress. I immediately thought it was Angela Lansbury but I literally just saw an article saying that it wasn’t her. So my next guess would be that this actress came from a cancelled show on another network. I can’t think of any other detective show as iconic as Murder, She Wrote but then again I only watched the show almost a decade and then some after its cancellation. The crying actress – I think maybe Angie Dickenson? Sharon Gless? I am ancient and I admit it – but I have no sympathy for Linda Bloodworth Thomason. She produced the address Bill Clinton made regarding Monica Lewinsky. She had no regard for the fact Lewinsky’s life was ruined in a day and age where #metoo wouldn’t see the light of day for 20 years. Television and writing was done a great disservice by Moonves by keeping your hands tied, in the end I think that is the goal of any abuser, render their victims powerless and voiceless. He didn’t have to touch you to victimize you, he killed years of your career because you portrayed women in a way he did not like: powerful. A powerful woman is a dangerous woman…to a coward. The actress is obviously Cybil Shepard from Moonlighting. More importantly to me, I love this statement by Linda Bloodworth Thomason. So well written and humorous while at the same time expressing her anger at a * who stole a good chunk of her professional life. So glad she wrote this. And I’m so happy that these * are finally getting the attention for what they truly deserve. [Optional] ABC is considering a reboot of Designing Women! Would you watch? Probably not. They will never be able to recreate the magic of the original; not even with the remaining living cast members. It just wouldn’t be the same without Dixie Carter or Meshach Taylor. Les Moonves is bad, but her old pal Bill Clinton is AOK? In other words, she is fine bashing someone who hurt her career, but hands off her friends who do the same (and worse) to other women. No offense to Angela Lansbury but do you really believe ole’ Les was trying to deep-tongue a woman who was then in her 60’s????? What an f-ing pig he is. And that wife? Also rumored to be a horrible person. Think the actress was Sharon Gless. No way it was Angela! I loved her in her mystery show but Moonves kissing her? Don’t think so. I also can’t see Sharon Gless crying. She’d be more likely to toss her water glass at the creep. I think it was Cybill Shephard. Not a fan of reboots. But I’ll give Murphy Brown a try. I loved the writing in Designing Women. I think every woman watching the show most likely found one episode that rang a bell. Mine was Ray Don butting in on a table of women.Julia did what I did years before. cybil shepard was on moonlighting with bruce willis so i think it’s her.